Amelia is happy to be at her granny`s place. A small backyard party is arranged, where Amelia and her friends are enjoying some fun-filled games. Granny is pleased to see her granddaughter in a great mood and plans to add some more spice in the party. 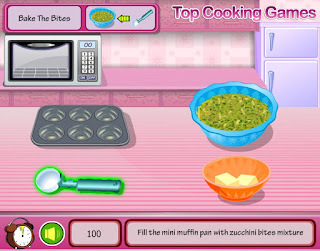 She decides to make delicious and tasty Zucchini Bites for Amelia and her friends. Play the game to help granny in preparing Zucchini Bites using all required ingredients. Enjoy cooking!